Hammond, IN. It seems that the partnership between, martial arts instructor and originator of Total Combat, Joe Goytia, and businessman, Dave Hemanez, was the spark that Total Combat needed. Although always presenting a great card, Total Combat was not drawing the attendance it deserved. The partnership now has Joe concentrating on match making and Dave on production and promotion. 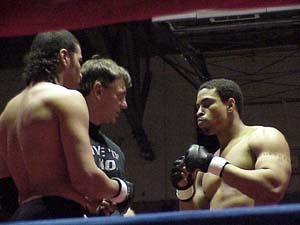 “Battle of the Badges,” was the first production of new Total Combat team. Frank Shamrock was on hand to sign autographs for the fans and present final awards for the tournaments. Frank made himself available to everyone. We saw Frank everywhere talking, joking and signing autographs all night. The night’s master of ceremonies was none other than “Freak” from Mancow’s Morning Mad House on Q101 FM in Chicago. Freak kept things running smoothly with give-ways and door prizes and was assisted by the Budweiser Ring Girls which definitely kept the attention on the Ring. This night’s card had a mixture of mixed martial arts and boxing. The boxing had the Chicago Police Department boxing team against the New York City boxing team. These were great matches including a female match that was the most action packed of all the boxing matches. Colleen Sabin, CPD, and Adrienne Delgado, NYPD, pounded each other. Neither woman willing to give ground. Delgado dominated throughout the fight but Sabin’s tenacity and ability to get in a few good punches of her own had the crowd and the judges on her side. The judges decision was given to Sabin but in all reality Delgado was the winner of that match up. Three 4-man tournaments and one title fight were slated for the night. By the end of the night, there would be a new lightweight, light-heavyweight and heavyweight champion. Standing middleweight champion, Jason Chambers, would defend his title against Justin Hynes. The strong right hand of Justin Hynes had Jason Chambers on the defense for a good portion of the fight. Chambers defense kept Hynes from doing much damage while wearing him down. After being stood up by the referee for being in the ropes, Hynes tried to shoot in for a take down but was a little too high. Chambers was able to cinch in a guillotine choke that had Hynes tapping in short order. The lightweight final had local favorite Miguel Torres against Brian Szohr. Each had won their preliminary fights to get into the finals. Torres was able to fend off Szohr’s attack without too much problem. Comfortable in the guard, Torres waited his time then applied the triangle choke for the win. Adrian Serrano silenced some critics with his easy win over a much younger Jason Veach. Veach had tried to standup with Adrian but his boxing was weak with Adrian getting the better of him. The fight then went to the ground where Adrian treated us to a clinic on how it is done. Taking side control, Serrano soon had Veach in a strong Keylock that finished the fight. In the finals, Hercules Mitchell was unable to answer the bell due to injury giving Serrano the title. The last tournament of the evening had favorite son, Jim Theobald, against Jay Massey. Theobald’s skill and experience was the deciding factor in this fight. Massey’s strength had Theobald stalled for a while but a mistake gave Theobald Massey’s back. It was just a matter of seconds before the rear choke was locked in for the win. Overall, the production was good but the hour and a half delay at the beginning had the crowd on edge by the time the fights started. Early advertising had the fights starting promptly at the slated time. Either the fights need to be scheduled later or the production has to start on time. Delay becomes a problem for the warm up of fighters. Staying warm and ready for over an hour is not feasible. The quality of the matches helped to overcome the few glitches in the production. The next production should have the rough areas straightened out. We are looking forward to the next production.